This classy appetizer hits all the right flavor notes with juicy slices of beef enhanced by a bold horseradish cream atop toasted baguette. Add a few decorative pieces of fresh frisée for the perfect finishing touch. Make the Crostini: Position a rack 6 inches from the broiler and turn the broiler to high. Rub one side of each bread slice with the garlic and set on a baking sheet lined with aluminum foil. Brush the garlic side with the oil and season with salt. Broil until the bread is browned, 1 to 2 minutes. Flip and broil the other side for another 1 minute. Make the Topping: Heat a small, heavy skillet over high for 1 minute. Season the beef with 1/4 teaspoon salt and some pepper. Turn the exhaust fan to high and sear the beef, flipping every couple of minutes until it's done to your liking, about 10 minutes total for medium rare. Transfer to a cutting board, let rest for 5 minutes, and then slice the beef thinly. 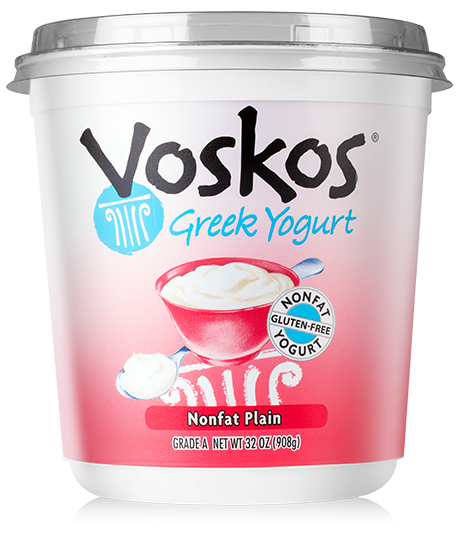 In a small bowl, mix the VOSKOS® Plain Greek Yogurt with horseradish. Season with 1/4 teaspoon salt and a few grinds of black pepper. 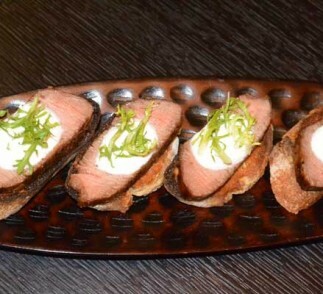 To assemble, top each crostini with a slice of beef, a dollop of the yogurt, and a small piece of frisee and serve.